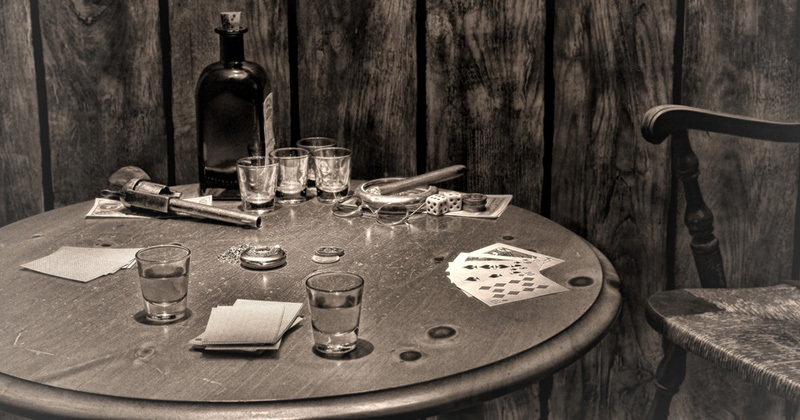 Years ago, in one of my former lives filled with escapade and mayhem, I would wander the saloons of the West seeking adventure and a quick bit of coin playing Texas Hold ‘Em with anybody who had the cash and gumption to make it interesting. I’d made my way through all of the cities that sounded up to the challenge – Deadwood, Wichita, Tombstone – when I decided to get off the beaten path. My reputation was preceding me and finding a high-stakes table was getting harder and harder. One particularly cold and eerie night, I found myself outside of Reno with a lucky pack of cards and a hefty load of cash that I’d won the previous evening off a fella who called himself the Gingerbread Boy. A sweet flaky sort with a plastered on grin, he was an easy mark but took off too quickly when he spied a gentleman he tremulously referred to as Mr. Fox … must’ve been quite the evil sort because he put the fear of the gods in the Gingerbread Boy who seemed too much of a joker to get on anybody’s bad side … but I digress. Back to the little town outside of Reno, a town so small it had no name … just a few houses and one main street with a church at one end, a general store at the other. Rumor had it that in a rickety old house down an unassuming side lane, Drury I think it was, there was a crazy old man who hosted some of the most amazing cards games that side of the Mississippi … and that’s where I headed with my bag of coin and pack of lucky cards. Inside sat a gentleman who seemed to be waiting for me. An odd sort he was; doughy and sweet but with a glint of steel in his smile that let me know he’d be a worthy opponent, someone who may give me a run for my money. After hours of the pot going precariously to one of us or the other, I’d had enough of this game; I felt my luck slipping. I called for one final all-in. Winner take all. Take no prisoners. But wait… he was short, short by quite a bit… I wasn’t going to take it on a technicality; I felt the anger rising. But he didn’t seem concerned; he seemed to enjoy the rise he got from the heat of the situation. He reached into his pocket, slowly enough that I wasn’t concerned for my safety, and pulled out a folded piece of paper. He placed the paper on top of the mountain of tumbling chips. I didn’t question that he’d equaled my all-in; I sensed he had laid his fortune at Lady Luck’s feet with that bit of paper. The cards were dealt. Flip, flip, flip they went slowly, one by one. The crowd collectively held their breath as the last card turned. “AARRGGGHHHHHH!!! !“ He screamed the scream of a tortured soul. “NOOOOOooooo……” dwindled to nothing as he seemed to disappear, devoured by his anguish. I pushed aside the mountain of chips, drawn to the treasure that he so desperately didn’t want to part with and it was then, only then, that I realized I had been in the presence of greatness… and I can honestly say when asked, that yes, yes indeed, I know the Muffin Man who lived on Drury Lane. And on that piece of paper were the recipes that made him famous and I share them below. Oh, that was fun! 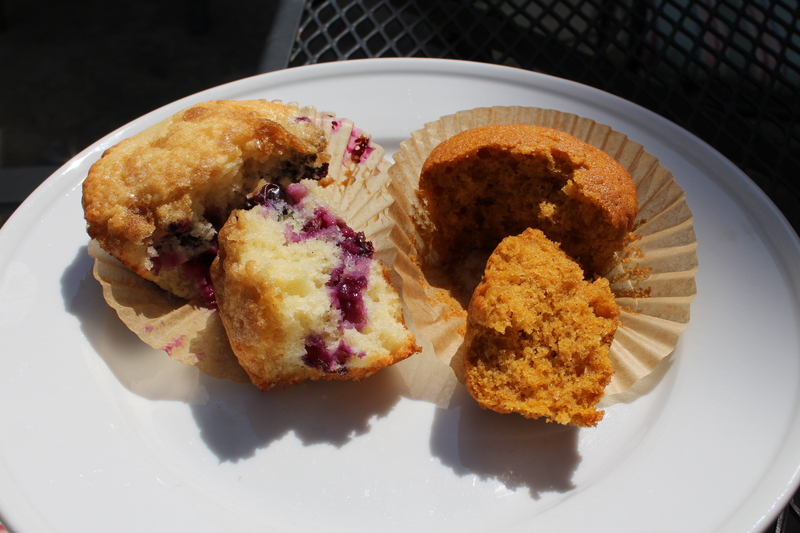 Just a little something in lieu of a family story – of which I have none – for these delicious muffins. And, honestly, would you have clicked on the post if it simply said “Yummy Muffins”? As to these baked beauties, I’ve been making them forever and they make my family and anyone else that I’ve made them for pretty happy. Oh, except for the lemon blueberry; Aiden thinks baked blueberries are gross because they squish. No accounting for taste and we just allow that that apple fell from the paternal tree. And here we go with Pumpkin Muffins and Lemon Blueberry Muffins … oven preheating! The only difference between making homemade muffins and baking the boxed variety (other than the lack of unpronounceable ingredients and artificial flavors and colors) is that you’ve got to have more ingredients and measure them out. Considering the boxed variety still requires paper liners, milk, oil, eggs, and sometimes butter, it’s just as easy to keep the dry ingredients on hand. And it’s not like you didn’t have to go to the store to buy the mix anyway. 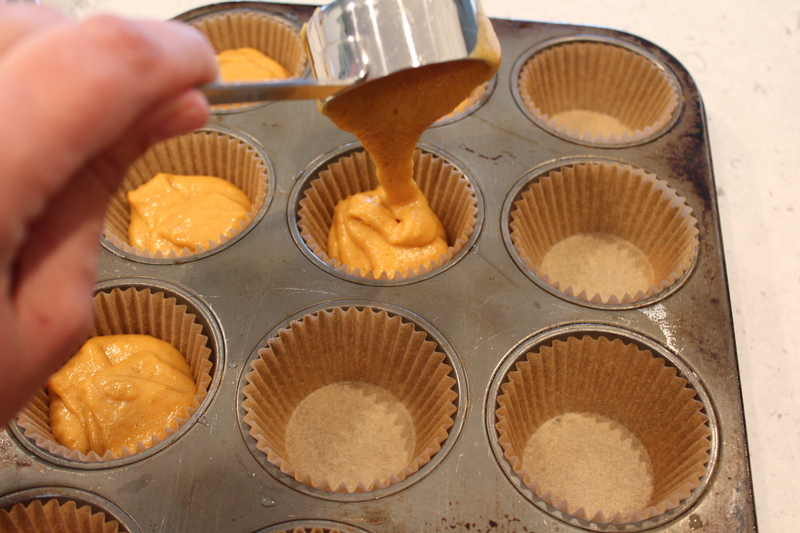 To illustrate (as above), for the pumpkin muffins, put all of the dry ingredients except sugar into a large bowl and whisk to combine. In another bowl, large enough to contain flying egg should you be an exuberant whisker, mix together the sugar, oil, egg and water. It starts out looking like it won’t take in all of the sugar. It will. Keep whisking. When you carefully measure the 1 cup of pumpkin puree, please confirm you are using pumkin puree and not pumkin pie filling. That will make a difference, and not really a good one. Ask me how I know. By the way, my idea of careful measuring in the instance of the pumpkin puree is a heaping cupful. Pour the wet ingredients into the dry ingredients and mix with a spatula just until combined. I don’t have a photo because this was a solo shoot and I forgot and it’s really not all that thrilling to see. Just remember wet into dry and don’t overmix. The pumpkin muffin batter is the consistency of a thick cake batter, easily pourable. Scoop 1/4 cup of the batter into each paper-lined muffin cup. Yes, you can use the no-stick spray (know what’s in THAT stuff?!) but I like the papers because they keep the muffins from drying out and keep them from sticking together if you freeze them for future use. I generally separate the herd into eaters and freezers right out of the chute. Once completely cooled, just pop into freezer bags in a single layer, squeezing out most of the air without smooshing the muffins, and toss in the freezer. They thaw pretty quickly or can be microwaved for a a few seconds. Toss them frozen into lunchboxes and they’ll be ready to go by lunch … or even snack time. But I digress. 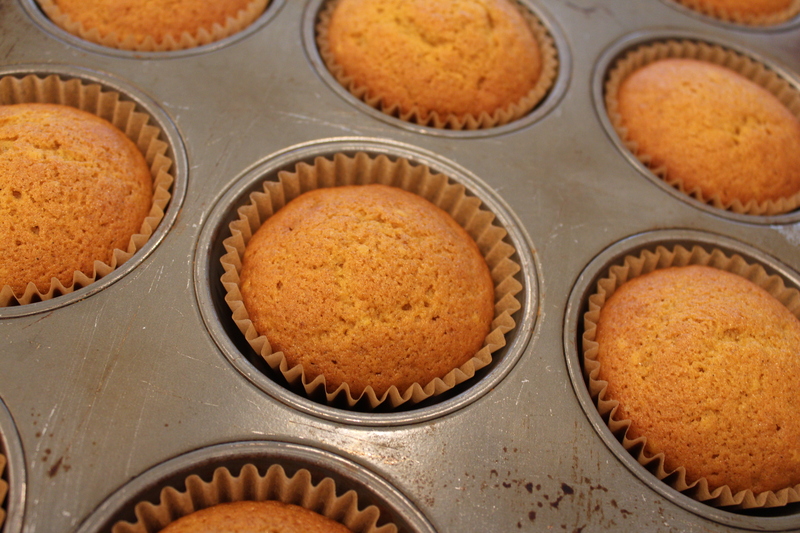 By only filling the muffin tins with 1/4 cup, you don’t get the dreaded muffin top. One wishes all muffin tops were that easy to control. Onto the lemon blueberry muffins.! 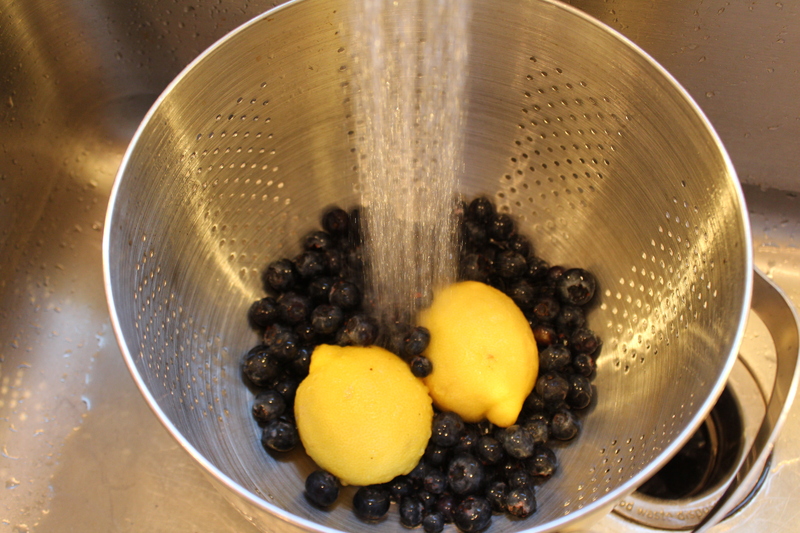 First wash your blueberries and lemons. Yes, the lemons. You will use their peel and you don’t know who before you was groping them or where his/here hands had been. 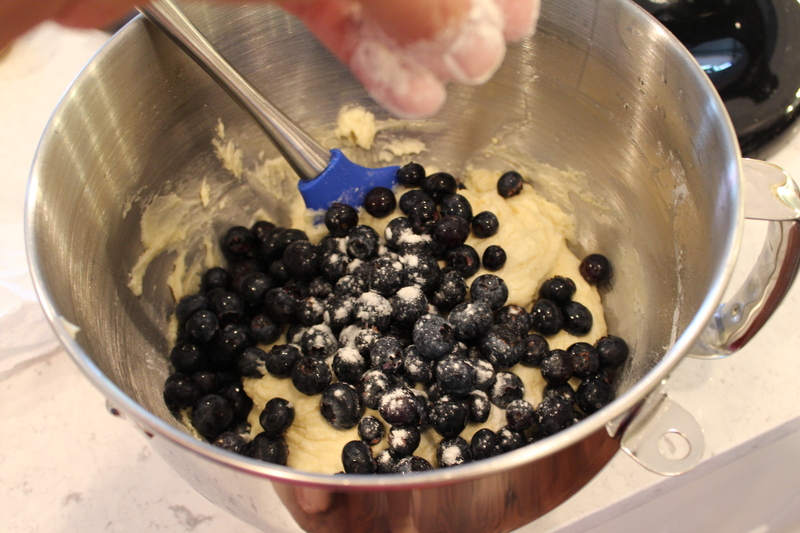 Let the blueberries drain; wet berries will sink in your muffin batter … not that that’s a terrible thing but does make for a pretty gooey experience. While cleaning the blueberries, carefully go through them to make sure there are no stems still attached. If there are, pop them off. Bits of wood ruin the muffin experience and cause people to wonder where else you cut corners in your kitchen. Don’t give them the gossip fodder. 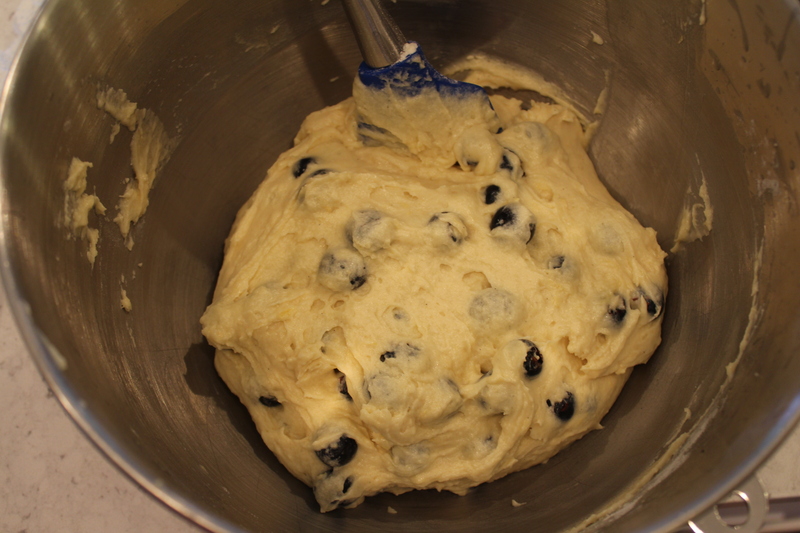 Or you can just use frozen blueberries and be done with it (same quantity, not thawed though the baking time may be a few minutes longer). Next, the lemons; one of the loveliest aromas in the kitchen. I’ve found that grating the lemon rind (no white part, if you please) and whisked into the dry ingredients helps distribute the flavor. Or I could have just made that up and imagine that it’s better this way. Really, it can also be tossed in with the wet ingredients. It’s ambidextrous like that. This muffin recipe does well by the mixer (read I am lazy and need to get to the streusel topping so let my mixer do the heavy work). Let the butter and sugar go to town on medium speed until light and not grainy. Add the eggs and mix. Carefully measure the lemon juice into the batter. Or not. I hate doing dishes so if I can avoid extras, I do. I would, however, heartily suggest that you turn off the mixer before putting your lemon squeezer into the bowl. If you choose not to heed that advice, please videotape and share when you return from the ER. Oh, !@*$%!! what happened?! It was all going along so fine and now it’s curdled! That was my reaction the first time I made these muffins. After you stir in the dry ingredients (which is what I am getting ready to do in the pic above) …. It smooths out to this lovely batter. Once again, add the dry ingredients and only mixed until combined. Over-mixing is a bad thing in the muffin world. Toss in the blueberries. I always sprinkle about 1/2 a tablespoon of flour over top before I mix them in. I’ve heard that helps keep them suspended in the batter. May or may not be necessary but why mess with a good thing. Stir the berries in very gently from the bottom up just until combined. If you use frozen berries, you’re more likely to end up with a lilac-hued batter. This is okay; it’s just the berry juice. Remember when I said to let the mixer do the work while you make the streusel? This is the streusel. You could use your fingers to combine but mine are always hot so I use a fork. The streusel ends up glumpy more than sprinkly (see below). This is fine. Though I guess if you added more flour or maybe oats (hey, I think I”ll try that! ), it would be more sprinkly. This batter is thicker than the pumpkin muffin batter. It’s sort of the consistency of greek yogurt (keeps its shape on a spoon). 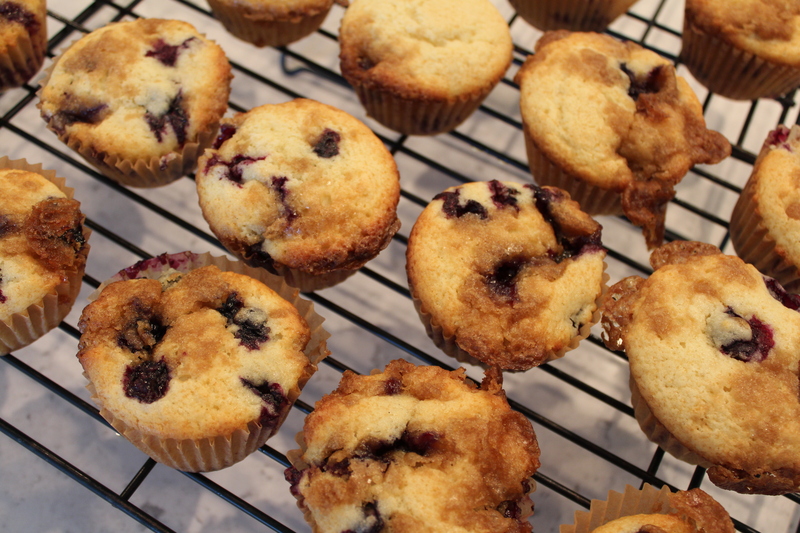 Scoop into the paper-lined muffin tins (and the papers are really necessary for the blueberries unless you want to be digging stuck-on berry goodness from your muffin tins. Evenly sprinkle the streussel topping over the muffins and bake. These muffins have dents and divots where the berries burst and collapse, with pockets of almost carmelized stressel bits here and there. They are not going to win prettiest in class but they are truly addictive. As I mentioned, I’ve only ever had one person turn them down and he more than makes up for it in pumpkin muffin consumption. Preheat oven to 375. Prepare muffin tins by either lining with papers or spray with nonstick spray. 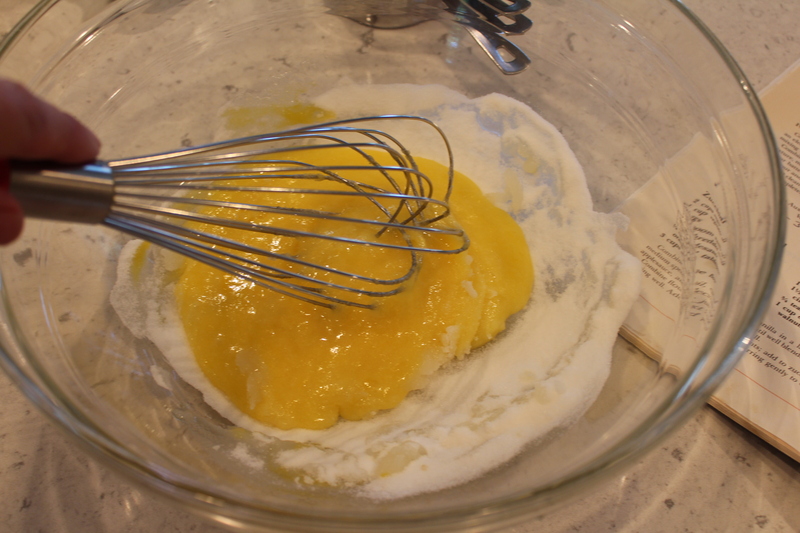 Combine sugar and eggs in a large bowl; beat with a whisk or mixer until well blended. Add pumpkin, oil and water, mixing well. In a separate bowl, combine the dry ingredients (except nuts). Mix well. Add to pumpkin mixture and gently mix just until incorporated. Add nuts if you are using them. Scoop scant ¼ cup batter into each muffin tin well. Bake 20 minutes or until toothpick inserted into center of the centermost cupcake comes out clean. Cool on rack. If using nonstick spray, remove the muffins from the tins after 5 minutes and allow to cool completely on the rack. Preheat oven to 375 degrees. Prepare muffins tins with either paper liners or nonstick baking spray. 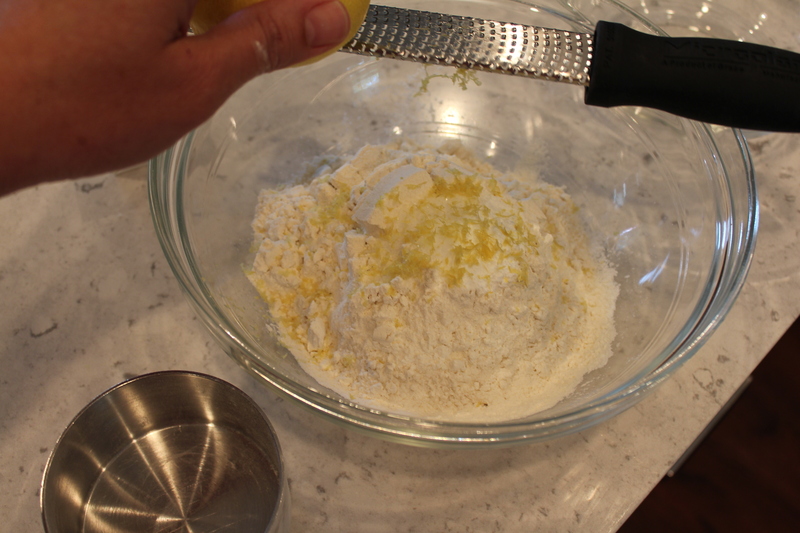 Combine flour, baking powder, salt and lemon zest in a bowl, mixing well. 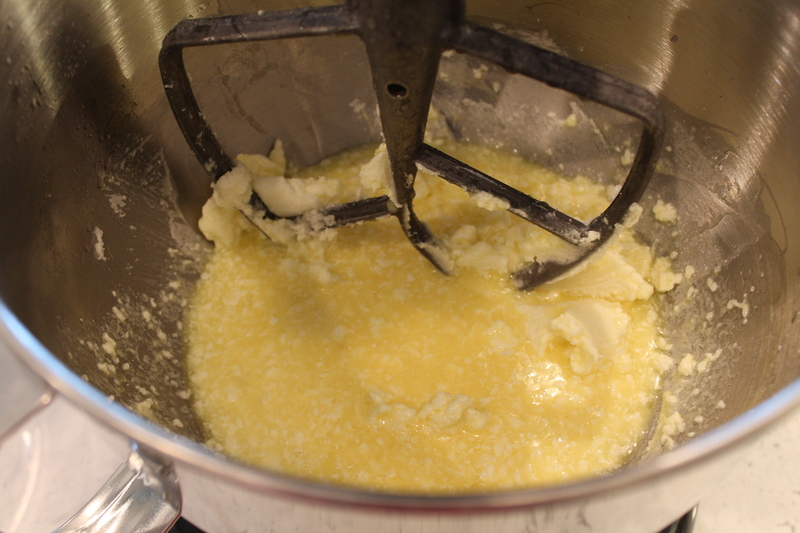 In a mixer, cream together butter and sugar until light and creamy. Add eggs, milk, vanilla and lemon juice. Mix until well incorporated. 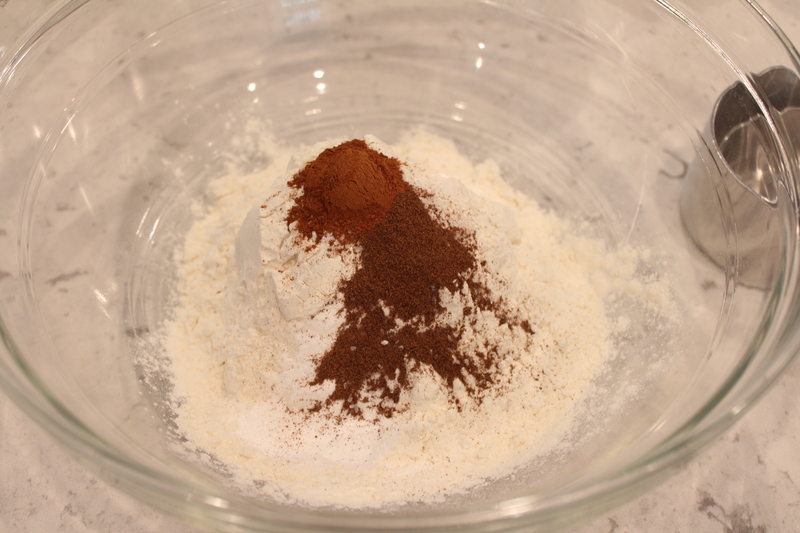 Add dry ingredients to the mixer and mix just until combined. Fold in the blueberries by hand. 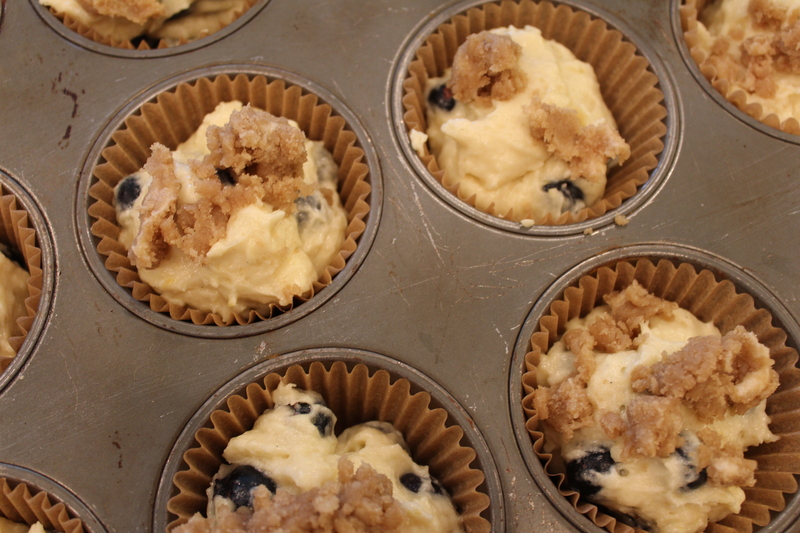 Scoop by ¼ cup into muffin tins. Combine topping ingredients, crumbling together by hand or with the tines of a fork. Sprinkle onto the muffins. Bake 20 minutes or until lightly browned on top. Cool on rack for 5 minutes and remove from muffin tin to cook directly on the rack. This entry was posted in Bread, Breakfast, Muffins, Vetegarian and tagged bake sale, blueberry, Breakfast, brunch, dessert, Easter, family, family favorite, Fruit, kids, lunchbox, muffin, office goodies, pumpkin, Snack, Spring, treats, vegetarian. Bookmark the permalink. Definitely my favorite so far Cuz! This post made me laugh out loud several times 🙂 Happy Eating! !